Note that apple petal fall should occur app. 254 DD (Base 50 BE), although obviously there is a range. 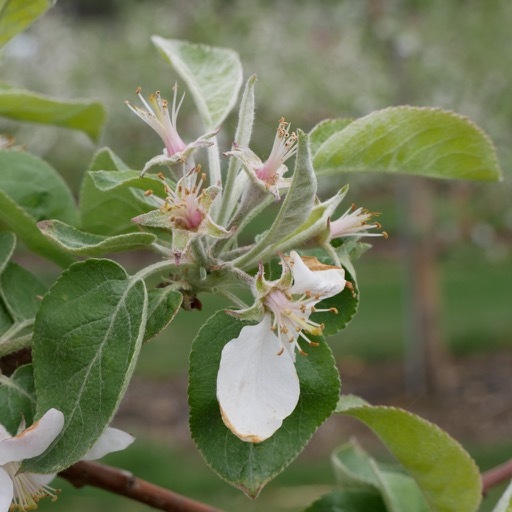 Estimated apple Scab Ascopsore Maturity, 8-May -- 81%; predicted to be at 99% on Saturday, May 21. Lesser Appleworm LAW -- 1st LAW flight begins around: May 6, Saturday. Peak trap catch: May 21. Oriental Fruit Moth OFM -- 1st generation OFM flight starts: April 26, Wednesday. 1st generation 55% egg hatch and first treatment date, if needed: May 29, Monday. Plum curculio (PC) -- Increased risk of PC damage as McIntosh and similar cultivars increase in fruit size: May 20, Saturday. San Jose Scale (SJS) -- First adult SJS caught on trap: May 18, Thursday. Spotted Tentiform Leafminer STLM -- 1st STLM flight, peak trap catch: May 4, Thursday. 1st generation sapfeeding mines start showing: May 18, Thursday. Optimum sample date is around Saturday, May 20, when a larger portion of the mines are visible. White apple leafhopper (WAL) -- 1st generation WAL found on apple foliage: May 8, Monday. • Remember some years it seriously warms up around bloom and bloom comes and goes within a matter of a few days? I wish. We've gained about two days of bloom over average in the last week, and given the generally poor bee flight (cold temps, wind, rain) we are going to need it. Still, I think apples like cool weather, and I expect set to be good. Time to seriously think about petal fall thinning applications, particularly carbaryl given the relatively cool temps. PGR's like NAA and 6-BA may be a waste of time and money when it is this cool? IMHO. I hope you can attend one of our twilight/thinning meetings this week to hear what Duane Greene might have to say about the thinning situation in 2017. I was hoping we would be a bit farther along when we had these meetings -- but not too far -- que sera, it is what it is. Baby it's cold outside, and the bugs have been feeling it, not out and about much yet. 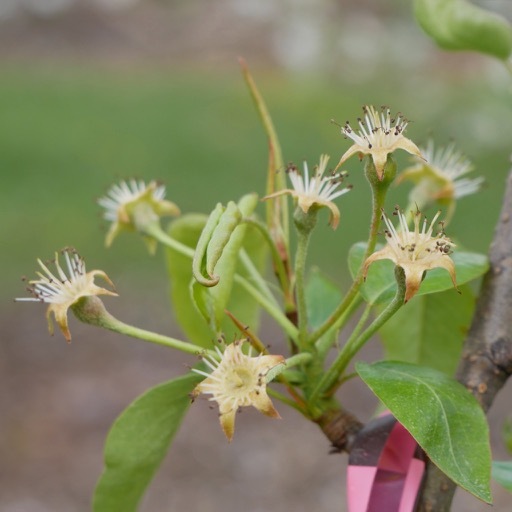 We have caught some European apple sawfly EAS on white sticky traps, petal fall insecticide (Sevin, Actara, Altacor, Assail, Avaunt, Exirel) ASAP if it's a problem for you. Plum curculio PC, well they aren't moving much in this weather, but you can bet your booty they will be when it warms up and fruit size reaches 6-7 mm: Imidan, Actara, Avaunt, Belay, Exirel, Venerate XC. Oriental fruit moth (OFM) pheromone trap catches have been high, but the petal fall/1st cover insecticide ought to work out for you on that. 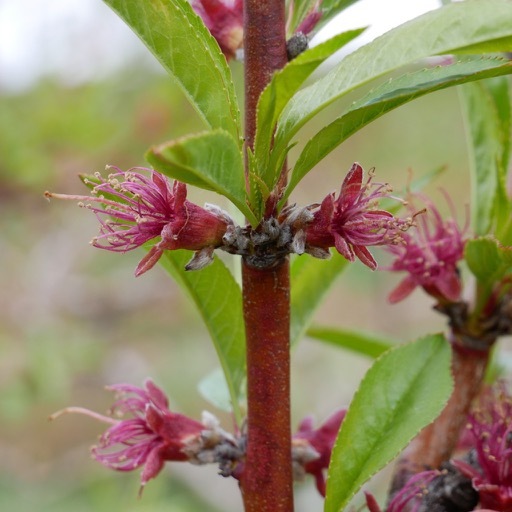 Many insecticides, including those typically used for plum curculio are effective, and mating disruption (Isomate CM/OFM TT) if you use it (in peaches) should be deployed as soon as it warms. Pet peeve of mine, however, don't tie those TT's too tight around branch, leave a big loop. Don't worry, they are not going anywhere. Look out for gypsy moth on young plantings (defoliation risk) and treat with B.t. or almost any other insecticide if found. I want to piggy-back on Liz's concerns below about burr knots and dogwood borer DB in apples here. See picts below. These solid plastic mouse-guards/tree wraps/herbicide blocks, although initially seeming like a good idea, well after several years on these Gala/M.9-337, are not looking like such a great idea now. Darkness and moisture have made for nice, tender burr-knot formation, which we are guessing dogwood borer adults will like once they start egg-laying. We are taking these off ASAP and watching for DB infestation come June/July. 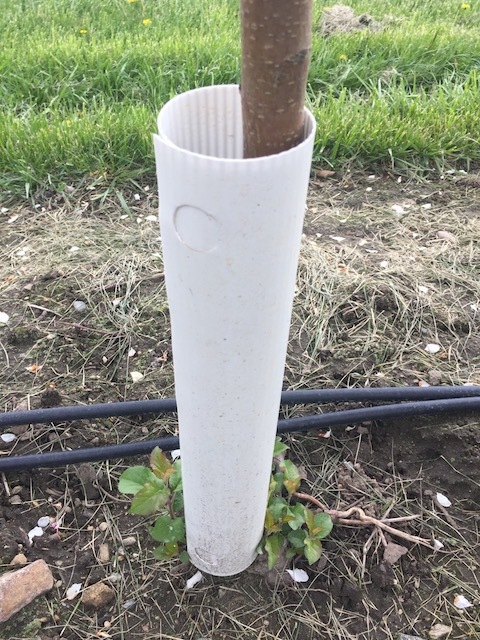 My standard recommendation now for young plantings to prevent herbicide injury and manage burr knot/dogwood borer is: paint exposed rootstock, graft union, and trunks up to where branching starts with undiluted, white latex exterior paint the year of planting. This should be sufficient to prevent herbicide injury to young bark and last for several years at which point herbicide to trunks becomes less of an issue. (Still, don't blast the trunk with herbicides!) IF you can't manage your orchard ground cover sufficiently to prevent voles from taking up residence, then you better use hardware cloth/mesh mouse-guards. Although I will still not be happy, particularly if they are put on stone fruit! ...they favor development of burr knots which lead to dogwood borer infestation! Take them off! 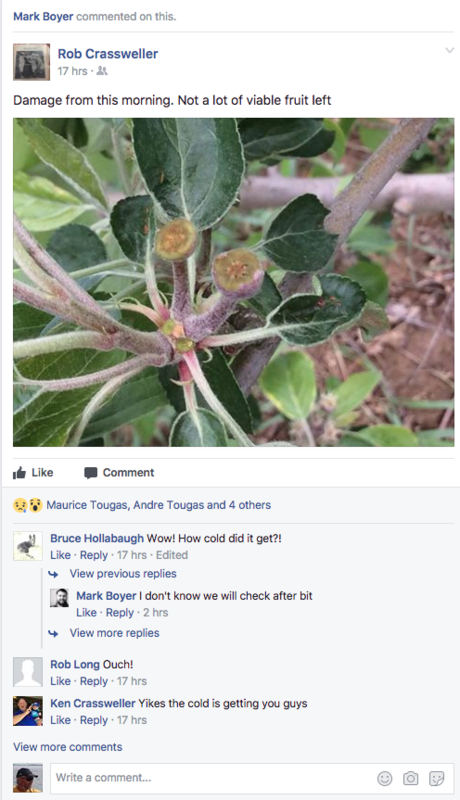 In Massachusetts so far this year we have had 3-4 important apple scab infection periods. For reference, see Regional Overview picts (MA-East and MA-West) from RIMpro below. (RIM value equates to infection potential.) Number 1: April 22-23. Number 2: April 26-27; Number 3: May 2-3. Number 4: May 6-7,8, which was a biggie. Based on the forecast(s) it looks like the next infection period will be May 14-15 app. At this time, spore maturity is such that 35-45% are still available to be released. Although not all will be released with the next infection. Get ready to spray: Mancozeb extended program (also good on rust), NO Captan after petal fall (risk of russet), SDHI's (good on mildew), DMI's (also good on mildew), QoI's (also good on mildew). Hint: should include something in the tank mix for mildew and/or rust to be safe, although mildew pressure has been light to date. Rust diseases, however, like this weather. Fire blight is pretty much a non-issue right this moment. The only real fire blight infection risk occurred app. April 29 to May 1. Apple and pear orchards with any bloom that was open beginning app. April 25, probably should have received streptomycin with any wetting. The weather forecast for the coming week calls for cool temperatures with rain expected on the weekend. Not only is this weather unfavorable for thinning it discourages bee activity and pollination. What to do? 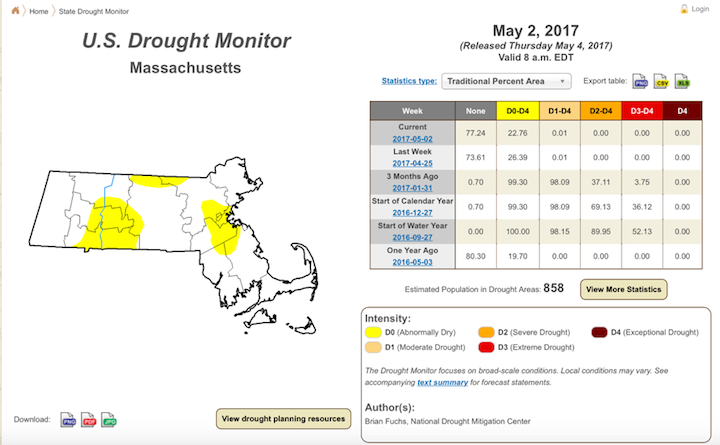 Most growers in Massachusetts do not blossom thin. If any grower choses to thin at bloom, I suggest that you use either Amid-Thin or NAA. A caustic thinner such as ATS or line-sulfur may cause some leaf damage especially on leaves developing under these conditions. Many growers routinely apply a petal fall thinner spray. Given the weather forecast I suggest that you apply your petal fall treatment right after the bees are removed from the orchard. For the petal fall spray you should not wait for favorable weather because there is none in the foreseeable future and you will have another opportunity. The decision to thin may be easier to make at petal fall since you will have the opportunity to observe bee activity during the bloom period. Carbaryl (1 lb/ 100 gal), Amid-Thin (8 oz/100 gal) and NAA (12-15 ppm) can be used as petal fall thinners. Thinners applied at petal fall are not as potent as when they are applied at the 7-14 mm stage. Once fruit grow to about 6 mm it will be possible to estimate the initial set. This is also a good time to cut a few fruit open to see how many seed these fruit have. Fruit with a high seed number are more difficult to thin than fruit that have a lower seed number. The weather following thinner application determines in large part the effectiveness of thinners. A good rule of thumb is to wait until fruit grow to the 6 to 7 mm size range and then select the first 3 day period where the temperature is forecast to rise at least into the 70s. Sometimes you must wait. 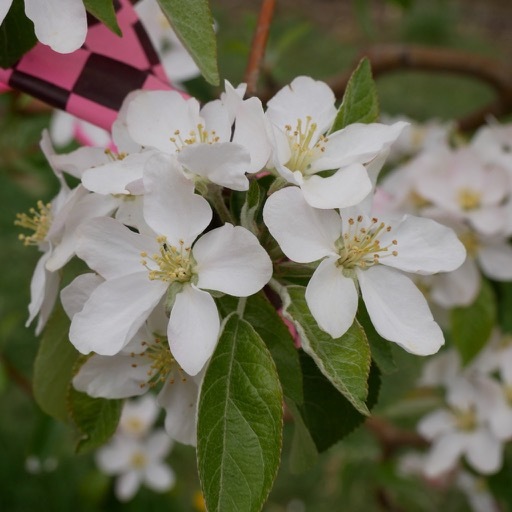 The carbon balance model (Apple Carbohydrate Thinning on NEWA) is now used by many growers. It is meant to be a guide to help you make thinning decisions. I suggest that you to use it that way. You, rather than the mode,l should be making the thinning decisions. If the cool weather pattern that we are experiencing now holds, I suspect that we may have another year with reduced fruit size at harvest. Therefore, thinning may be more important than in other years. A strategy that some may want to consider is to apply MaxCel (or Exilis Plus) at the 10 to 14 mm stage to increase fruit size. Thinning from this application will not be great as long as carbaryl was not used at petal fall or it was not included in a previous thinning spray. Call it "Liz's Corner" if you want this week. 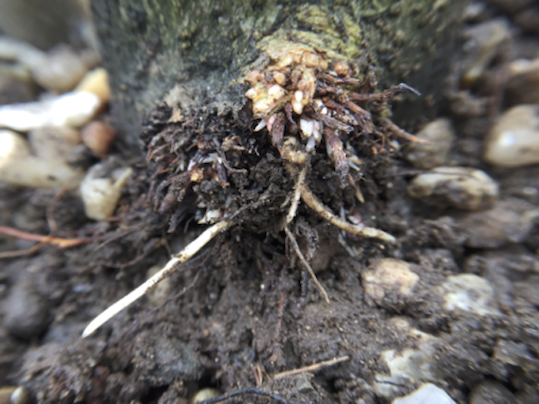 Burr knots, those pesky but often-avoidable root initials, are sending out new roots (bright white in the picture below) in this damp weather, especially where weeds have been permitted to grow up against the trunks. 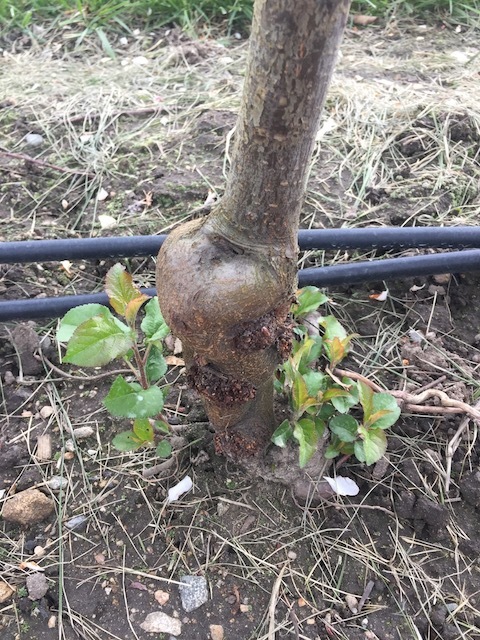 While there are a number of dwarfing and semi-dwarfing rootstocks available that are resistant to burr knot development, even those may form burr knots when weeds are allowed to grow in around them creating damp humid microclimates that stimulate adventitious root growth. An approximately 3’-4’ wide weed free strip in row is ideal. Sacrificing sleep in order to make pesticide applications in the wee hours of the night is not the only way to make pollinator protection a key part of your IPM strategy this growing season. 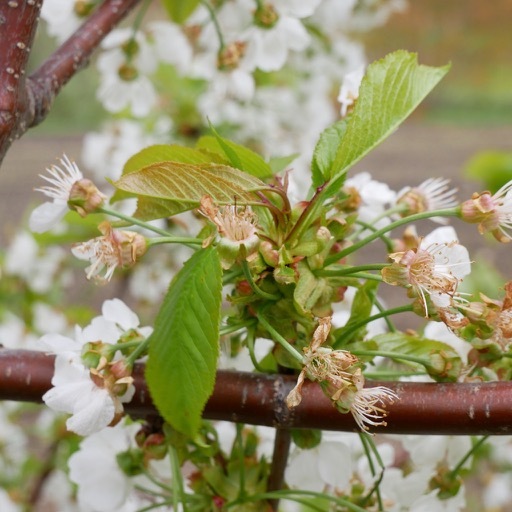 After bloom has run its course, maintaining awareness of pollinators in your orchards remains essential to their health. Reducing or eliminating blossoms on weeds in rows by regular mowing will go a long way to minimizing off target exposure to harmful insecticides. Even insecticides that are listed as having a relatively low toxicity to pollinators and other beneficial insects can still do damage. 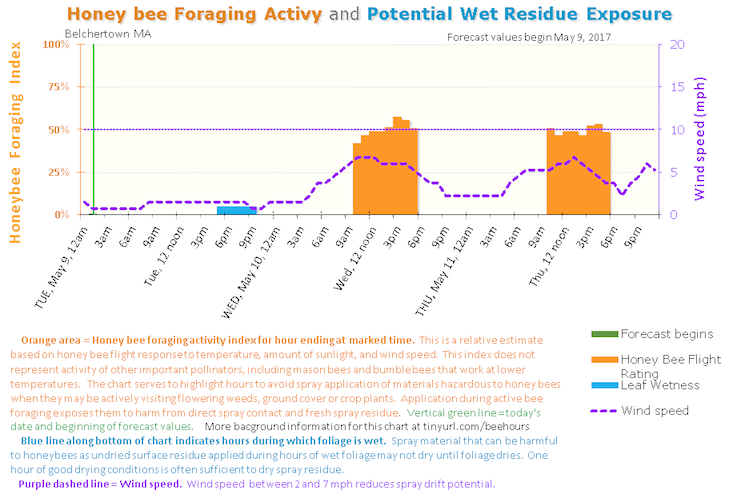 If you are looking for a quick, at-a-glance way to see if honeybees are active in your orchard, you can check out UMaine AgRadar’s honeybee foraging activity model. Pictured immediately below is the current foraging forecast for Belchertown. The key point in these graphs is to avoid the orange and blue times when spraying. A quick note on the climate and apple scab: in spite of a portion of the state (~22%) still being considered “abnormally dry”, we are well on our way to having a “normal” scab season. All this wet weather is driving spores out at a rapid rate. If the weather continues like it is, we are well on our way to wrapping this scab season up well in advance of last years marathon slog. The next Healthy Fruit will be published on Tuesday, May 16 or thereabouts, 2017. As always feel free to get in touch with any member of the UMass Fruit Team (http://extension.umass.edu/fruitadvisor/team-members) if you have questions or comments.